Bangkok is renowned for its luxury shopping malls, with grand marble interiors, high end brands, sparkling diamonds, slick Lamborghinis, big screen tvs, awesome restaurants and enough activities to compete with an amusement park. However, luxury shopping mall is not an accurate description of Pantip Plaza. Instead, this five storey shopping centre is quite run-down and reminds customers of what shopping was like in Bangkok in the 1980s. Notwithstanding its dire need for a refurb, Pantip has been forgiven for its run-down state because of one big reason. It has become one of the biggest shopping centres in the world specialising in anything and everything computer related. It truly is a geek’s dream come true. Enter the massive front archway entrance and straight away your senses are overloaded with vendors selling phones, motherboards, graphics cards. software, movies and lasers. From the mid 1990s onwards, I could easily spend a whole day roaming Pantip, purchasing software, and all the components for a new PC piece by piece from individual vendors. I used to careful scour every single store, looking for odd or hard-to-find gadgets. Likewise, I would carefully examine dvd catalogs, looking for the more obscure movies from the 1980s. Pantip plaza did not start life as a computer mall. In fact, its location is a little bit odd, as it stands all on its own on Petchaburi Road, slightly isolated from Bangkok’s main shopping hub. It’s original opening was therefore barely noticed, and no-where near as important an event as when the likes of Central Chitlom, MBK or Siam Paragon first opened. I couldn’t find any confirmation on-line, but I think Pantip Plaza first opened in about 1986 or 1987 and was unsuccessful in attracting shoppers (note, the Bangkok Post has an article suggesting it didn’t open until 1993, but I am positive that there was a shopping centre in this location in the late 1980s, as I used to buy model paint etc there). As a result, from its opening date until about 1994, it was largely deserted and the shops that it did contain sold all kinds of odds and ends. There wasn’t any real theme to the stores, and instead it just seemed to be that the owners were trying to fill space by offering low rent. During this period, the one theme that did stick for a while with the plaza was radio control and models. This part of Ploenchit Road was already the place to go for the hobbyist, especially with Amorn’s Hobby Shop being just across the road from Pantip, and a couple of other hobby shops nearby. As a result, Pantip ended up with a bunch of really good RC plane and car shops, as well as plastic modelling shops. By 1994, the new theme emerging in Pantip was electronic toys, then electronic parts, then computer parts, and by 1995, it was quite obvious that the majority of stores in Pantip focused on electronics and computers. Pirate software and VCD movies also became readily available and pretty soon Pantip built up a reputation with Bangkok Thais as being the place to go to if you needed a new computer, software or any form of electronic repairs. It didn’t take long before taxi drivers were taking tourists to Pantip, and guidebooks were listing it as THE computer mall for Thailand. Once inside, you will notice an escalator that can quickly take you all the way up to the second floor (bypassing the first floor), where you will find the Thai food court. After the escalator the floor opens up into a big open area filled with little stalls selling mostly electronic toys, gadgets and mobile phones. In addition, you will find a few pirate software and dvd vendors. If you head further down to the end, you will get a few non-IT stores, such as banks, a tailor, optometrist, book shop, and closer to the parking lot, a lot of computer places offering spare parts and repairs. 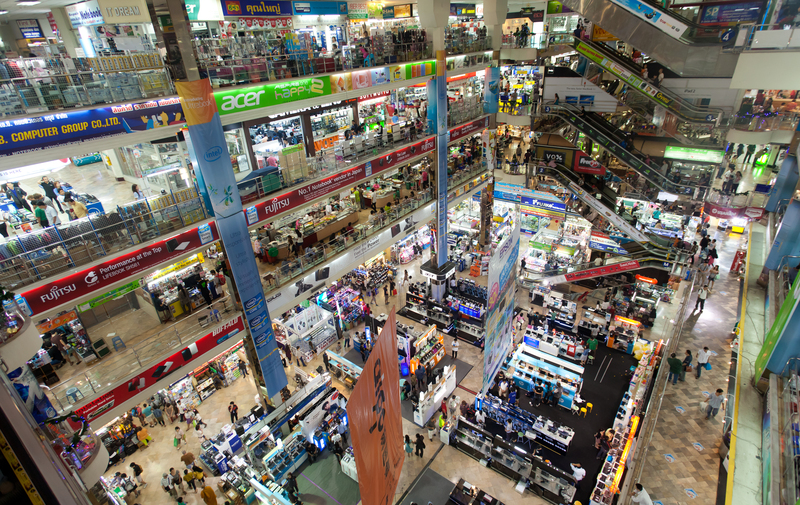 First Floor – Most of this floor consists of a large chain store, Data IT, that sells legitimate computers, accessories and software. In addition, towards the front of the store are a few vendors selling video and camera accessories, Apple stuff and general computer peripherals. Second Floor – As mentioned, this is where the Thai food court is. This is a coupon system where you buy coupons from a kiosk which you use to buy food, and get a refund on unused coupons once you are finished. If you like authentic Thai food then this is a great place for it. There is also a stall here selling beer (nothing better than a penang curry and a frosty cold Heineken). The food court only occupies a sort of mezzanine level overlooking the front. The rest of the second floor has small stores selling all sorts of computer parts, peripherals and books, as well as a few video and camera places. In addition, I kind of recall that it is this floor where there is a really good music store. Third Floor – As with the second floor, there are lots of shops selling computer parts and peripherals. In addition, this floor has a big concentration of both legitimate and (mostly) pirate software/movie vendors. You can spot them by the tables containing photo albums showing off software and movie titles. As tempting as the prices seem, all that the vendors are selling these days are files that were downloaded off the internet and the vendors themselves don’t necessarily know if they will work or not. If you do buy something that doesn’t work, good luck trying to get a refund, and don’t push too hard because purchasers have been assaulted in such situations in the past when arguing with pirate vendors. Fourth Floor – This floor seems to move away from pure computers and gets more into computer repairs, and peripherals such as networking gear and printers. Because this floor is a bit more off the beaten path, it gets fewer customers and stores are often more willing to bargain on this level. Fifth Floor – The last floor is only a partial floorplan and is dedicated exclusively to IT City, which is very much a DATA IT clone. It gets a bit lonely up on this level, with not that many customers. Pantip Plaza was always in a bit of an odd location. However, it is pretty easy to get to. If you are going by skytrain, then get off at Ratchathewi station (in front of the Asia Hotel), exit on the north east exit (opposite side from the Asia Hotel) and walk due east along Petchaburi Road. Once you pass the Indonesian embassy, you are almost there. If you are at Central World, then simply exit the shopping centre and head north along Ratchadamri Road (keeping on the Central side), cross over the khlong (canal) and turn left on Petchaburi Road. You will pass Platinum Mall (a cheap fashion mall) and shortly after you will arrive at the front of Pantip Plaza. Opening hours are officially form 10am until 8pm, although given most of the shopping centre is made up of small shops, the individual stores open whenever the proprietor feels like getting out of bed. Accordingly, lunchtime until about 6pm are optimal shopping hours. 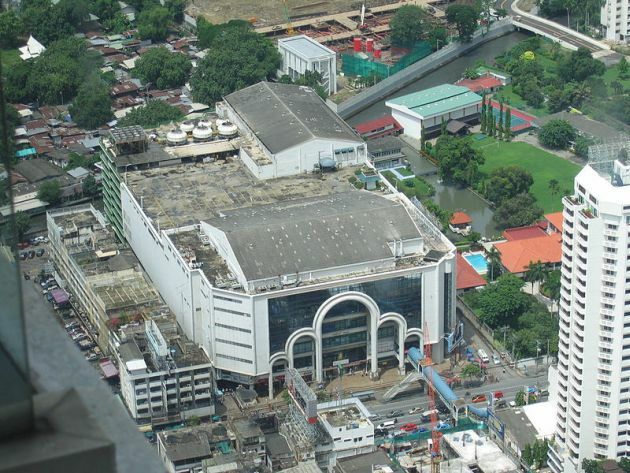 The fun thing about Pantip Plaza is it offers a great hunting ground for trying to find unusual or hard-to-find items. Similarly, if you need a computer or electronic item repaired, then Pantip is your place. If you are just after readily available electronics or phones, then most of the main shopping centres will have what you need. Similarly, if you just want some pirated software, most tourist oriented markets and more conveniently located shopping centres (such as MBK) provide a more convenient option (however, I don’t believe it is worth it, given the lack of quality control and open hostility of pirate retailers). In such cases, I probably wouldn’t waste my time making the trek to Pantip. Interestingly, Pantip was recently given a light renovation, and there is now talk coming from the anchor stores that the building owner wants to move all of the IT related stores over to Palladium (intersection between Petchaburi Road and Ratchadamri Road) and rebrand Pantip as a high fashion mall. One of the reasons for this seems to be that most IT retailers can’t pay the high rents expected of a luxury mall, therefore the owner needs to replace them with high end brand stores instead. Unfortunately, I don’t see this strategy working. People only made the trek to Pantip because of its reputation as one of the world’s largest IT malls. Once it becomes just another (lesser) clone of the luxury malls on Ploenchit Road, there will be no reason to make that trek any more. Therefore, I strongly recommend that you get yourself to Pantip and visit an interesting footnote in IT and piracy history, before it disappears.